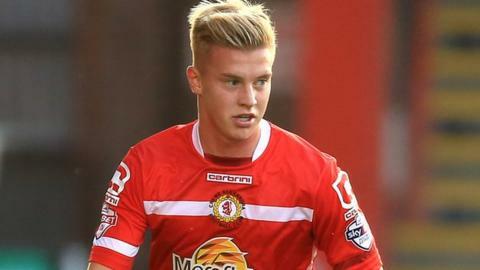 Crewe midfielder Adam King got the only goal as the Alex claimed their first win of the season to climb off the foot of League One by winning at Shrewsbury. King scored in only the second minute, drilling home from 20 yards after Shrewsbury defender Jermaine Grandison was dispossessed inside his own half. The hosts pushed for an equaliser but could not find a way past Ben Garratt in the visitors' goal. Crewe have only scored nine goals in as many games this season - and top scorer Adam King has got four of them. The young Swansea City midfielder signed for the Alex in July on a half-season youth loan until 5 January. Their closest effort came when Jordan Clark's shot hit the the crossbar. Shrewsbury drop to 19th after this season's fourth successive home league defeat, three points above 23rd-placed Crewe, who leapfrogged Blackpool at the bottom of the table. "I don't know how you measure frustration - but that has to be one of the most frustrating afternoons I've had at this club. "I cannot believe that Crewe have won that - and if anyone disagrees with that, they were watching a different game. "Crewe can find themselves as a really fortunate team. We weren't good enough to put the ball in the net. In the really dangerous areas we didn't have that killer instinct." "We didn't do as well as I'd have liked in possession at times and gave the ball away cheaply at times, but as a defensive unit we were immaculate. "It wasn't pretty at times, but we had to do the nitty gritty to grind out a result. We defended extremely well and restricted them to half chances. "It was another good finish from Adam King. He has a knack of coming inside and firing those shots off with his left foot." Match ends, Shrewsbury Town 0, Crewe Alexandra 1. Second Half ends, Shrewsbury Town 0, Crewe Alexandra 1. Corner, Shrewsbury Town. Conceded by Stephen Kingsley. Delay in match Jean-Louis Akpa-Akpro (Shrewsbury Town) because of an injury. Attempt missed. Larnell Cole (Shrewsbury Town) right footed shot from the right side of the box misses to the right. Attempt missed. Marcus Haber (Crewe Alexandra) header from the centre of the box is just a bit too high. Delay in match Adam King (Crewe Alexandra) because of an injury. Attempt missed. Sullay Kaikai (Shrewsbury Town) right footed shot from outside the box is too high. Corner, Shrewsbury Town. Conceded by George Ray. Substitution, Shrewsbury Town. James Collins replaces Abu Ogogo. Attempt saved. Jermaine Grandison (Shrewsbury Town) header from the centre of the box is saved in the top centre of the goal. Attempt saved. Larnell Cole (Shrewsbury Town) right footed shot from outside the box is saved in the bottom left corner. Corner, Shrewsbury Town. Conceded by David Fox. Marcus Haber (Crewe Alexandra) wins a free kick in the attacking half. Attempt missed. Jean-Louis Akpa-Akpro (Shrewsbury Town) right footed shot from outside the box is just a bit too high. Mark Ellis (Shrewsbury Town) wins a free kick in the attacking half. Substitution, Shrewsbury Town. Sullay Kaikai replaces Mat Sadler. Substitution, Crewe Alexandra. Marcus Haber replaces Lauri Dalla Valle. Corner, Shrewsbury Town. Conceded by Jon Guthrie. Matt Tootle (Shrewsbury Town) wins a free kick on the left wing. Foul by Stephen Kingsley (Crewe Alexandra). Substitution, Crewe Alexandra. George Ray replaces Ben Nugent because of an injury.